We went into 2016 with an ambitious agenda – elevate awareness surrounding the financial toxicity of cancer and expand our reach in a way like never before. Rallying our community, we set out on the road to success. We hosted knockout fundraisers and stimulating industry events, joined our families in the trenches with new financial tools and even spent some quality time at the White House. In our books, 2016 was a top-notch year, and we’re proud. We’re proud because it means more families are getting to the other side of cancer, with fewer financial roadblocks. That’s something we feel good about, and you should too – thank you for helping us fulfill our mission. We wouldn’t be here without your support. 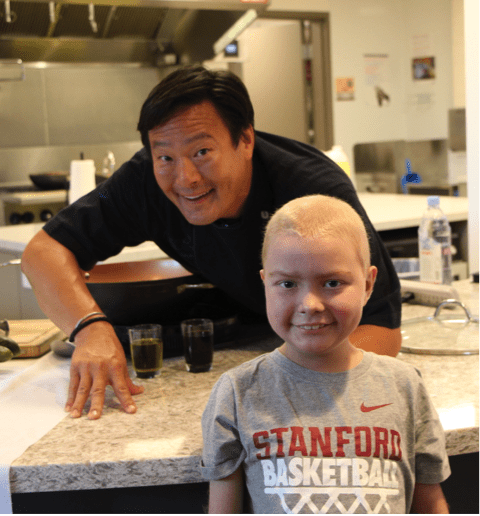 Ming does a cooking demo at Lucille Packard Children’s Hospital. This year, we took the gloves off and made it our mission to show the world that we’re more than just a nonprofit doing a “nice” thing. We play a key part in a cancer patient’s survival. Thankfully, we have a network full of fearless talent to help us accomplish this. Ming Tsai, celebrity chef and President of our National Advisory Board, is the definition of courageous. Anthony Rizzo, Family Reach supporter and a World Series champion, pretty much wrote the book on what it means to truly be an all-star on and off the field. And our very own Dianne Lynch, Director of Special Events and Outreach, is the true definition of a champion. Needless to say, we’re never short of inspiration. To truly tackle what’s at stake when a patient is diagnosed with cancer, we hosted IMAGINE 2025: A Solution Generation Session on the Financial Burden of Cancer. At this event, we didn’t just scratch the surface of the financial crisis of cancer, we dug deep – really deep. Our panel of cancer families was fearless, sharing intimate details of their financial struggle to an audience of healthcare, advocacy, pharmaceutical, finance, communication, technology and transportation professionals. Through brainstorms and workshops, several solutions were born that have set the stage for our 2017 agenda. A quick selfie with VP Joe Biden. 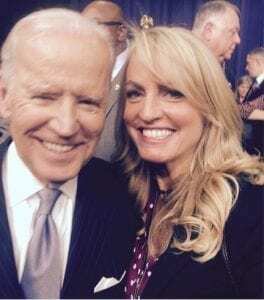 When I was asked by Vice President Joe Biden’s Cancer Moonshot team to present at his event in October, I knew some preparation was in order. I also knew that to truly reach people, I had to speak from the heart. I turned to my go-to phrase, “It’s not charity, it’s humanity.” It’s something that really resonates with my team. Apparently, we aren’t alone. Supporters old and new latched on to this statement. These words perfectly summarized the values behind several of our 2016 initiatives. The launch of our Financial Handbook is one example of this. A resource by cancer patients and caregivers, for cancer patients and caregivers, this tool is designed to help families before they hit rock bottom. It also paved the path for our Financial Treatment Project. Answering the Vice President’s call for collaboration and innovation, the Financial Treatment Project addresses every aspect of the cost of cancer crisis, opening the lines of communication and providing families with the resources they need to maintain their whole financial health while they fight cancer. Here at Family Reach, we believe access to these resources is a basic human right. Young cancer patient Emma Wyman works the crowd at Cooking Live! Coast to coast, our supporters near and far help us reach families in every corner of the country through their hard work and dedication. Our premier fundraiser, Cooking Live!, is one example of this. 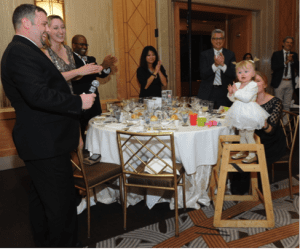 Reaping nearly $1 million, the 2016 Boston and New York culinary events set the bar high for all Family Reach fundraisers moving forward. A stronger sense of community was cultivated and lasting connections were formed at both. Our community of athletes also grew in 2016. Through countless Reach Athlete events, cyclists, runners, yogis and fitness junkies of all types united across the country to raise funds and awareness of our mission. Kenji Freedman, member of our National Advisory Board and Reach Athlete founder, continues to amaze us with his ambition, positive energy and heart. It doesn’t end there. We had a hefty helping of conference presentations, backed by data that made the case for all that we do to help families struggling with the financial burden of cancer. Facts found in this STAT article highlighting Family Reach are just one example of this research. Volunteer initiatives, hospital visits, golf outings and donor matching programs also elevated our awareness and further expanded our community in 2016. None of it would have been possible without the strength and determination of our long-time supporters, for which we will always be grateful. As the year comes to a close, we are at peace with all that has been accomplished. But until no family has to bear the financial burden of cancer, we will not be content. January 1 marks the start of a new chapter, and an opportunity to do even more. We’re eager to begin, and we we’re grateful to have you join us and leave your mark.